Northern Irish rockers Snow Patrol were back on the road after a 7-year break, reaching out to fans with their new 2018 album Wildness and a sold-out UK arena tour. Adlib provided crew, with top systems specialist Sam Proctor and an L-Acoustics system. Proctor was joined by Terry Smith who looked after stage and monitors for Hickey, plus Aaron Greig and Neil Dodd who completed the audio crew. The L-Acoustics K1 system was specified by Pepper. Adlib had supplied a small PA and control package for some warm-up shows mid-last year and has previously worked with both Pepper and Hickey to provide a touring control package to their specification on the band Foals. The Snow Patrol tour’s standard system configuration was 14 x K1 speakers a side with four KARA downfills delivering the band’s characteristic robust and solid sound – together with eight K1 subs flown behind the main hangs to help direct the low end towards the back of arenas. These were supplemented by two side hangs of 12 x K2 speakers each. On the floor were 21 x KS28 subs in a spaced array. Seven stacks of three high subs, each with a single L-Acoustics X8 on top for front fill. This allowed each stack to be driven by a single amplifier, leading to tidy and logical cabling. A flown cluster of four KARAs spec’d by Pepper eliminated the need for any infills, helping to keep the stage completely free, which was both an acoustic and an aesthetic decision leaving a clear stage and a flat floorspace uninterrupted by black boxes. All speakers were driven by L-Acoustics’ LA12x amplifiers and all the processing completed at FOH via a Newton multi-source processor. These have been available for around a year and are fast becoming an Adlib standard. Proctor has optimised his workflow to put the Newton at the centre of the processing operation, handling all the delays and EQ for each zone of the PA, as well as being a front-end matrix mixer to get all consoles into the system. Pepper’s console of choice is the Midas PROX which he ran with a selection of carefully chosen outboards. 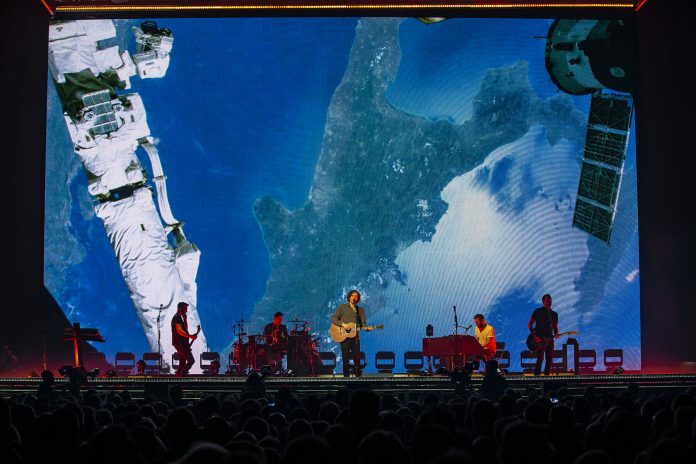 He’s mixed Snow Patrol since the last section of the previous touring activity in 2011 and specified the L-Acoustics system because of a long history with the brand. With up to 100 inputs, he finds the console hugely flexible for this MO of mixing and the colour coding is another important part of the console customisation allowing him to have everything he needs at his fingertips. The quest is to keep the mix clean and simple, so they are all selected for sonic tactility and to add character to the mix. Some classic dbx compressors are constantly used for additional punch and impact harking back to the Midas XL4 days. “Compression is really important to me, especially for those sections when I’m mixing right up to dB limits,” he commented. He used some UAD plug-ins for the first time on this tour which he likes – especially the extra distressors which can “glue everything together”. He multi-tracks the show each night, which is used for virtual sound checks, effectively replicating the real musicians and show volumes to give a good representation of what the mix will do in a venue and how the acoustics will interact – all to get the best possible result. Gary Lightbody uses a Sennheiser SKM5200ii RF transmitter with a DPA D:facto capsule. His vocals sit high in the mix and it’s vital to the audience experience that they hear the lyrics crystal clear. Hickey has been with Snow Patrol since January 2018. With the band having not toured for seven years, some of the initial focus was dedicated to finding the newest technologies to suit their monitoring needs, for which Jamie received carte blanche to suggest and trial. Hickey is using Sennheiser 2000 IEMs, and there are 5 band mixes plus a spare. Additional mixes include a guest mix, five tech mixes, a management mix and a cue mix. With 88 inputs coming from the stage, Jamie’s desk was a DiGiCo SD7 which he ran with 32-bit input preamp cards. He said: “The SD7 is the best thing out there right now! It’s rock solid and has never let me down.” Adlib created one of their famous ‘stage wardrobes’, custom made to Jamie’s spec. This accommodated 48U of pre-wired stage racks and power distro in a quickly deployable format each day, so Terry Smith had just three cables to connect between the console and the wardrobe. Hickey has worked with Adlib before, initially in 2012 with the Liverpool based company as his audio vendor, and then in reverse role the next year when he was one of the technical team for the Summertime Ball at Wembley Stadium – a gig serviced by Adlib for the last several years. Adlib supplied a full touring mics-and-stands package for the two opening acts together with a support monitor system and two Midas PRO2 consoles.